The Department of Culture, Media and Sport (DCMS) released its report into cyber security this month. It looked at the TalkTalk cyber attack reported in October 2015 alongside the broader issues of cyber security and data protection. The ICO gave evidence to the committee and will be issuing a formal response over the coming months. The TalkTalk incident is one of many that have happened and continue to happen. To consider it in isolation of others would be misleading. The overall context is complex and changing fast... The problem space is international. The Federation of Small Businesses (FSB) said that a third of their members had been the subject of cyber-crime. The recently published Cyber Security Breaches Survey 2016 commissioned by the Department for Culture, Media and Sport (DCMS) found that 25% of companies experience a cyber-breach at least once a month. Research from Intel showed that 43% were caused by internal actors (employees, contractors and third party suppliers) and half of these were accidental. 49% of companies are accredited to the Government?s Cyber Essentials and Cyber Essentials Plus scheme, or are on their way to accreditation. In the year to March 2015, the ICO received 14,368 "concerns" under the Data Protection Act and around 180,000 under the Privacy and Electronic Communications Regime. 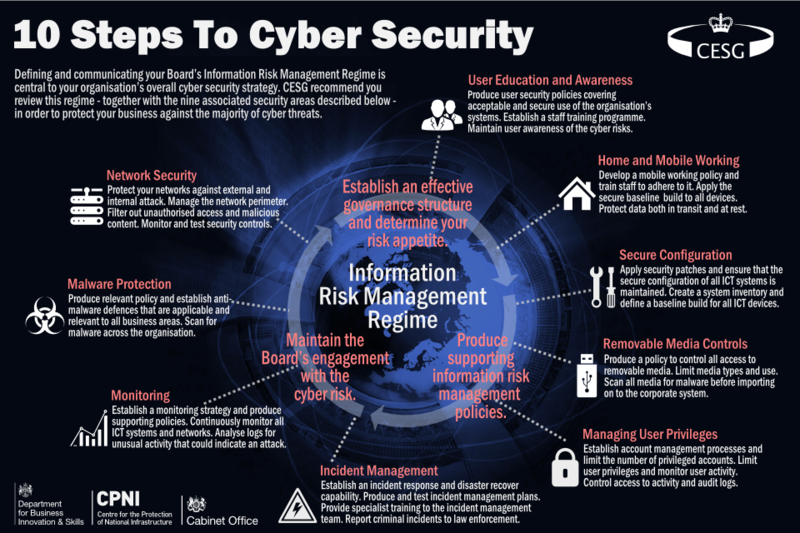 The government have published "Ten Steps to Cyber Security" and there's a useful infographic (see below) and is provided as guidance is for organisation looking to protect themselves in cyberspace. Alongside this version of the 10 Steps they are also publishing a new paper, Common Cyber Attacks: Reducing The Impact. We work with a variety of different organisations, both in the public and private sector and are amazed at the lack of knowledge of these threats or their responsibility, in terms of data protection. It's an area that all organisation should take very seriously. If you would like to know more get in touch with our offices and we'll be happy to have a chat and point you in the right direction. We constantly strive to ensure our applications are secure, but this is undermined if internal policies aren't in place.